ISR-affiliated Assistant Professor Derek Paley (AE) has won a $400,000 National Science Foundation Early Faculty Career (CAREER) Award for Dynamics and Control of Motion Coordination for Information Transmission in Groups. Paley will study information transmission in biological groups (like schools of fish) and apply the same principles to design motion coordination strategies for autonomous vehicles. Specifically, Paley's research will improve understanding of information transmission in biological groups and apply this understanding to synthesize bio-inspired motion-coordination algorithms for autonomous vehicles. How do schooling fish respond collectively to an external stimulus that is perceived by only a few individuals? How might we enable a fleet of autonomous vehicles to coordinate their movement using only sensory perception? He will use tools from estimation theory and computer vision to perform quantitative analysis of collective behavior in schooling fish; conduct laboratory experiments to test the hypothesis that schooling fish use motion coordination to amplify external signals and attenuate noise; construct an analytical modeling framework for information transfer in a kinetic interaction network; and synthesize bio-inspired motion-coordination algorithms using nonlinear-control tools. The broader significance and importance of the proposed research activities lie in the promise of improved understanding of collective behavior in biological groups and improved capacity to model and synthesize collective motion in engineered networks. Improved tools for tracking biological aggregations can be used to understand mosquito swarms in malarial regions; to monitor the role of krill swarms in carbon sequestration; and to assess the impact of bacterial aggregations on human disease processes. Research in biologically inspired coordination of unmanned systems has applications in the inspection of aging civil infrastructure; improved forecasts of hurricane intensity; and environmental monitoring of climate variability. It is not presently understood what motion coordination strategies yield fast and accurate information transmission in biological systems because sufficient data to quantitatively analyze and model three-dimensional motion in large groups are not available. 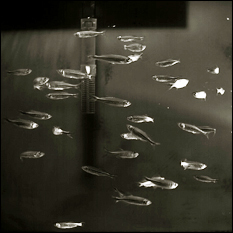 The proposed fish-tracking research will yield new tools for automated, three-dimensional trajectory reconstruction of the position, orientation, and shape of individual fish in a high-density school. "Research in biologically inspired coordination of unmanned systems has applications in the inspection of aging civil infrastructure, improved forecasts of hurricane intensity, and environmental monitoring of climate variability," said Paley.